Bridgeport Sound Tigers' rookie center Trevor Smith has 14 goals and 15 assists in 45 games since being recalled from ECHL Utah. Sure, Trevor Smith used to volunteer at goalie camps when he was a teen in North Vancouver to be a nice guy. He'd shoot one or two or several hundred pucks at the goalies just to let the netminders work up a sweat and refine their games. And maybe he'd file away a few tricks of the trade at the same time, like how goalies react to certain shots and where they attempt to bury their weakness. And that's to say nothing of how Smith developed a hard, accurate shot as a little perk. "It was (important) to get exposure to these goalies," Smith said. "I look at it as a workout, and I was a student." Smith, now a rookie center with the Bridgeport Sound Tigers, is still searching for, and frequently finding, the right answers. 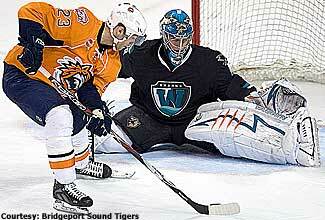 As one of the best snipers on the team, he has 14 goals and 15 assists in 45 games for the Sound Tigers. Smith's numbers may seem modest at first blush, but factor in this. After the Islanders have finished ravishing the Sound Tigers' offense -- at one point the team's top five scorers were on recall -- the free agent out of New Hampshire has often been left to tote the team's attack virtually solo. Heavy burden, meet heavier shot. "He's a scorer. He's a shooter. That's what he does," Sound Tigers coach Jack Capuano said. "We just hope that's consistent." And why wouldn't it be, besides the fact that Smith has skated with pretty much everyone in the Bridgeport phone book. Ask him how many linemates he's had this year, and he just laughs. He guesses 18 or 19, then jumps up to maybe 25. "It's tough not to know guys' tendencies," Smith said. "You just have to communicate with the guys. I try not to change my game at all. Hopefully, guys will follow the way I play. I wouldn't say it's pressure. I'd say it's stepping up your game. You're getting more opportunities to produce." Besides, all the comings and goings help Smith replicate part of the college lifestyle that he found so hard to leave behind. Smith bolted UNH after a sophomore campaign in which he produced 21 goals and 22 assists in 39 games. He said it was a hard decision, but like so many other hopefuls he found the pro portal tough to shut close. "The college lifestyle is totally different than anything I've experienced playing hockey," Smith said. "The social part of it is awesome. That part of my life is over now. I'm looking ahead." He ought to, considering how his season began. Smith had a shaky training camp and it didn't take but a few AHL games to see he was in over his head. He was sent to Utah of the ECHL, and the sunny-side up part of him beams to this day about how enjoyable it was to spend time in that part of the country. But not too much time, especially if you're a young hockey player who left college early with your sights set considerably higher than Double-A hockey. "You have a lot of (concerned) thoughts like that," Smith said. "It was a big learning experience for me. It was a mess. When I was with Utah, I was like; 'This is where I am right now.' It got me fired up to prove that (slow start) was not me." Smith made an eloquent case for himself in Utah, producing 11 goals and 14 assists in 22 games. On Christmas Eve the hockey Santa brought him the best present of all -- he got a phone call telling him he was recalled to the Sound Tigers. "It was a great feeling. All the work I did there (in Utah) paid off," Smith said. "Now I have to prove to my coaches and teammates that I'm not going to go anywhere but up from here." He's well along that way. Even with opposing defenses having little to focus on but him, Smith earned league rookie of the month honors in February after tallying eight goals and seven assists in 13 games for the Sound Tigers during the month. "He's brought his 'A' game back to Bridgeport. He protects the puck very well. He goes to the tough areas very well," Capuano said. "I just felt way more secure when I came back, just more confident with the puck," Smith said of his second time around with the Sound Tigers. "I think I was always the same player, but it took me awhile for it to come out." A lot is emerging from Smith these days, much of which flows counter to that of the typical jittery rookie. He's chatty from the first verbal faceoff, conveying both determination and a sense of ease at the same time. When he really wants to unwind, he'll break out his guitar and try for a different type of harmony with his teammates. "I'm trying to jam out when I can," he said. "It's pretty relaxing. I'm all right. I wouldn't get up and perform in front of people. I'm all over the map. I like some country, some rock and roll." Sometimes, the same old routine is what works best. The two most important goalies in Smith's life now are his teammates, Mike Morrison and Joey MacDonald. They are a lot harder to solve than those youngsters that Smith used to singe at the goalie camps. The upside is that Smith doesn't need to play it coy any more. When everyone's wearing the same pro sweater, advice is simply there for the asking. "Morrison and MacDonald, they're fabulous. They are pretty helpful," Smith said. "You always try to get an edge with (other) positions. Who knows? Maybe I'll win a shootout after practice and win some money off these guys. Maybe I'll win some more after I learn their tendencies."